Volatile prices for materials and often slim margins mean it’s crucial that maximum payload weights and space are fully utilised for baled waste. Materials like paper and card, plastics, cans or RDF, are bulky and need to be compacted and baled to facilitate economic handling and storage. But achieving uniform and stable bales with optimum weight and density can be problematic. Appropriate bale dimensions to ease container loading is still an issue, especially with older machines. And bales aren’t always a nice, easily stackable, shape. Contamination can be an issue. Poor compaction will often result in deformed bales which expand or sag. Three factors to watch for: Compaction, Shape and Size. Compaction is governed by the density of the material you are working with and the press force of the baler. A channel baler or twin ram machine with 80 or 100 tonnes press force is ideal, especially where multiple waste streams are handled. The better the compaction the greater the weight of the bale, but loading is also important and some pre-processing may also be required. As a general rule the greater the size the bale the harder it is to achieve bale density/weight required to make payloads. Shape is all about the uniformity, stability and integrity of the bale. If the material is well compacted and properly tied the bale should maintain a nice regular shape, which will facilitate handling and loading. Poorly tied bales, insufficient ties, or wire ties of the incorrect gauge and hardness, can all cause problems. Bales that burst may need to be re-baled and deformed bales will be harder to handle and difficult to stack and load. Size or the dimensions of the bale, discussed in more detail below, dictate how efficiently the container is loaded. There is wide variation across the industry but it’s an important factor to get right to ensure space isn’t wasted. The challenge for many operators is balancing throughput, the speed at which you can process material, with bale density, how much material you can crush into the same space. This is an important calculation to get right. You need to process and bale material at a rate that keeps up with the volume of material arriving at the depot, but sacrificing density for speed is unlikely to make economic sense when you take into account onward transportation, storage and handling costs. 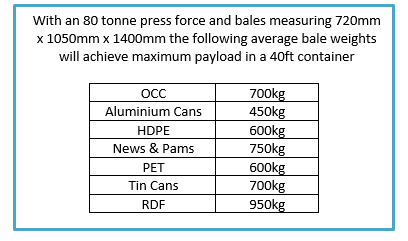 For example average bale weights for HDPE or PET should be in the region of 600kg, but if you are only averaging 300kg for the same volume, and we see plenty of examples, you’re transportation costs will increase. Machine choice will always be a bit of a compromise because most operators are working with multiple waste streams and therefore switching from one material to another each with different properties. While the horizontal channel baler or shear press is the industry stalwart, older machines won’t necessarily deliver the compaction needed. A modern twin ram machine however like the Middleton ME2R80, which compresses material against a solid wall before ejecting it sideways, will produce significantly heavier bales, with fewer compression strokes and lower energy consumption. For container transport of baled waste we would normally recommend a twin ram machine because it will always produce a more consistent bale in terms of size but can also handle the widest range of waste streams. There are a number of things you can do as an operator to maximise production. 1.) Monitoring bale weight will give an immediate indication of what’s going on. It’s essential to ensure the pressure is properly adjusted for the material you are processing and that the machine is regularly serviced. The addition of shredders, perforators and other pre-processing measures may help. 2) How the baler is fed and loaded is also key. A smooth and consistent feed of material is essential to produce uniform well compacted bales. Conveyor systems, hopper size and operator training all contribute. If bale weight is down these are some the first things we look at. 3) Remarkably bale size is still an issue. For example a 40 foot container should accommodate 48 bales measuring 720 x 1050 x 1400mm or 32 measuring 1050 x 1050 x 1400mm. If you are achieving high bale density/weights then you may not need to fill the container completely to achieve maximum payload. Containers generally measure 2.4 x 2.35 metres and we maintain the dimensions of the bale to suit this, at the same time allowing space between the bales for manoeuvrability and some expansion. An existing machine may give you the flexibility to adjust size to fit, but if you are buying new this should be a key consideration. Making money from recycled waste remains challenging. With literally thousands of containers in transit optimising payloads is essential. Even a small percentage improvement will go straight to the bottom line. Monitoring your operation, introducing regular training and maintenance for the balers you use and planning ahead with your supplier will help optimise your baler operation for the future.